Every member of the Trail of Churches is big. 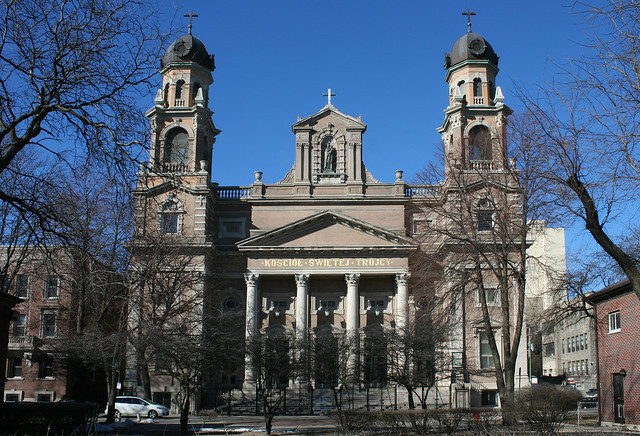 But the biggest of all is Holy Trinity Church, 1118 N Noble Street. Behind that elaborate facade lies a vast sanctuary, clear of any interior columns but over loaded with ornament. Despite its many glories, it is sheer size that must be counted as Holy Trinity’s crowning attribute. 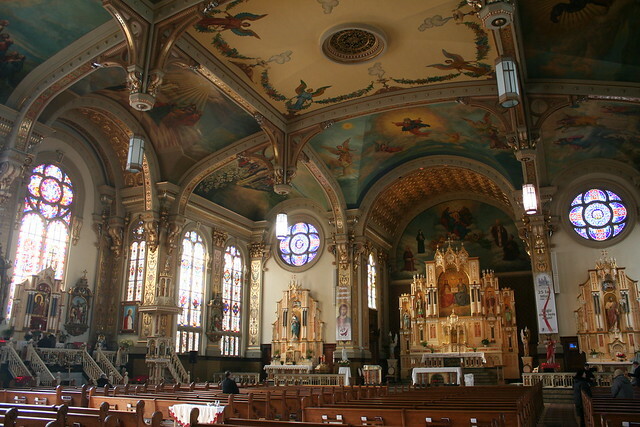 Free of interior columns, a hundred feet wide and almost twice as long, the sanctuary seems incredibly vast. The architecture acknowledges this break with the traditional cathedral form, with a wink and a nudge – truncated column heads and arches drop down from the ceiling, placed about where a row of columns would normally be… but they end in the air, supported by nothing but the hidden iron vaulting above. 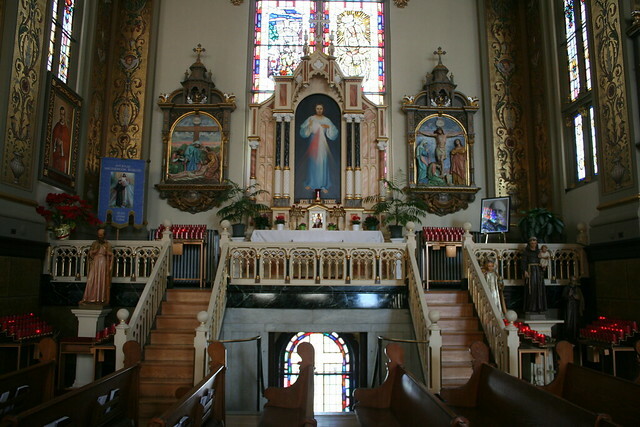 The two largest side chapels are architecturally integrated into the building – they sit above the sanctuary’s side entrances, and must be reached by stairs. No one style dominates. The arch above the altar is Romanesque. The guilding is Baroque. The reredos features pointed Gothic arches. The column heads are Greek Ionic. Wikipedia gives a far more complete history than I could hope to, but the essentials are thus: the parish began as an offshoot of St. Stanislaus Kostka, just up the street. 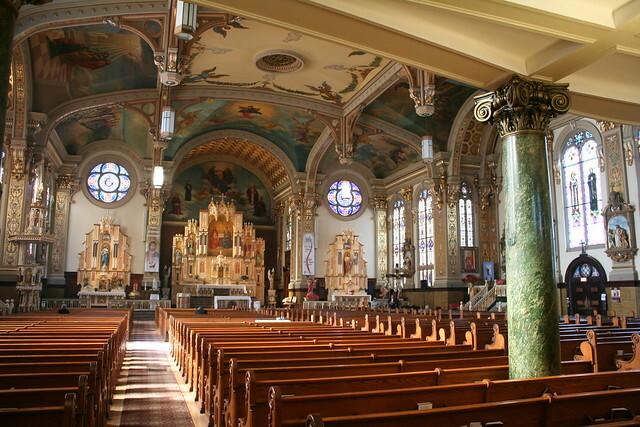 Originally considered an overflow component of that parish, it was finally recognized as a separate parish in 1892 after a protracted feud with the mother parish. 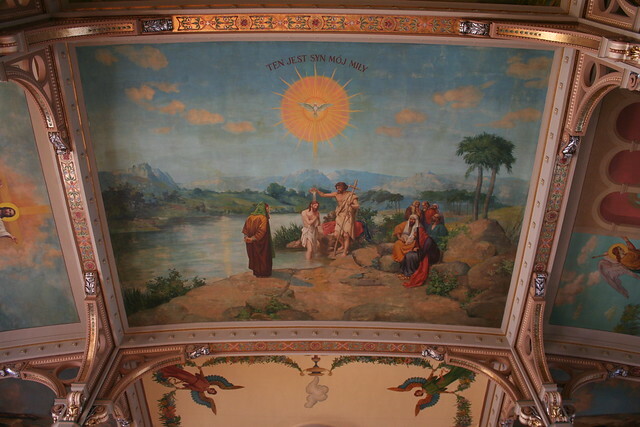 Over thirty years after splitting off, they began a new church building, designed by architects Herman Olszewski and William Krieg, and opened in 1906. 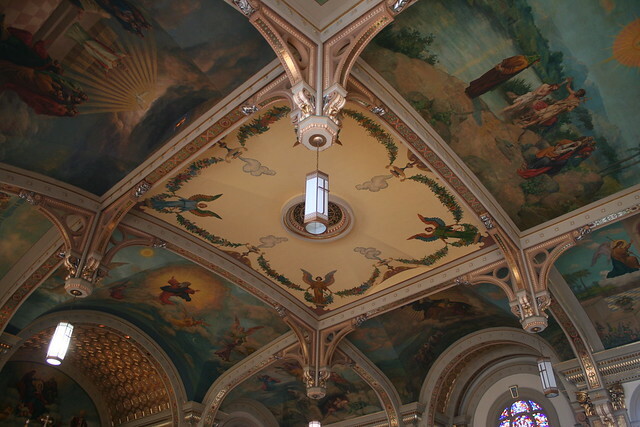 Decorations, murals, and stained glass were added one at a time over the following decades. 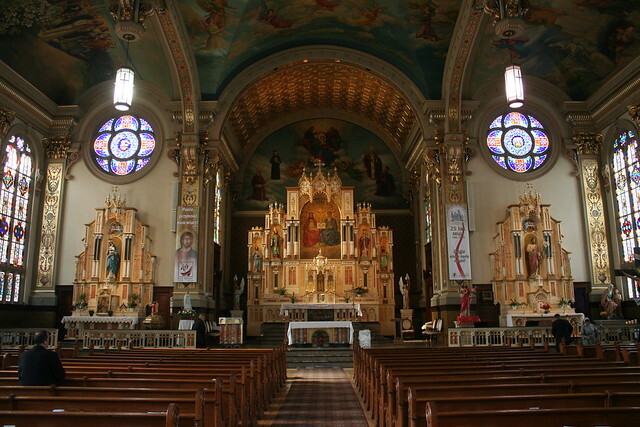 The spat with St. Stanislaus Kostka – relating to property ownership, assignment of priests, and various other issues – was well documented in papers of the time. With its resolution, the 1905 cornerstone laying was a grand affair, keynoted by the Pope’s delegate to Polish American churches and attended by a reported 50,000 Poles. The dedication of the finished building a year later was met with equal ceremony, with about 90 different Polish societies and organizations joining in a massive parade leading up to the new church. 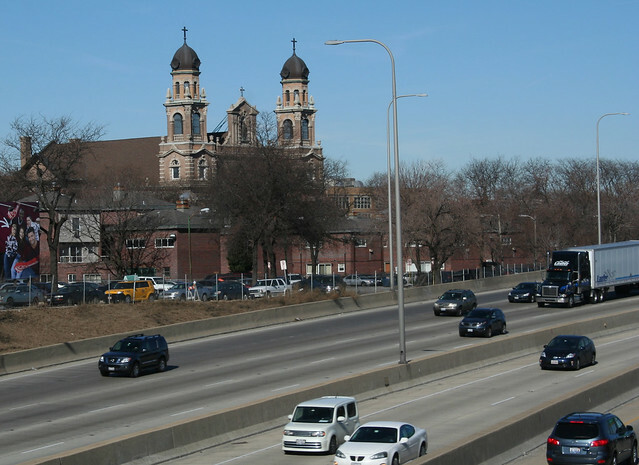 In the modern era, the church followed the same arc of decay and renewal as St. John Cantius as congregants moved away and the Kennedy bashed its destructive path through the neighborhood. 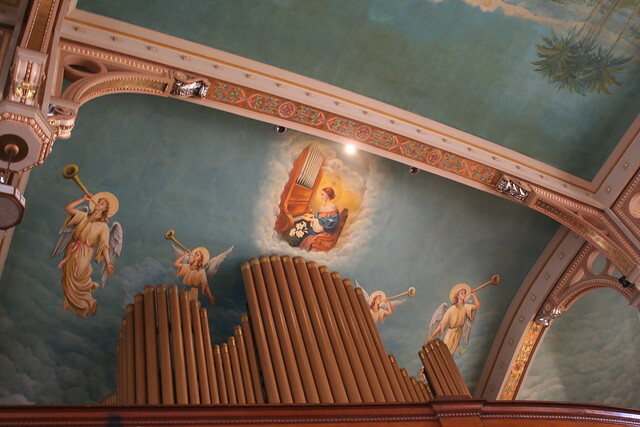 The parish faced closure in the mid-1980s but was granted a reprieve, to focus on operating as a “mission church” to new Polish immigrants. The comeback culminated in a 2005 restoration. 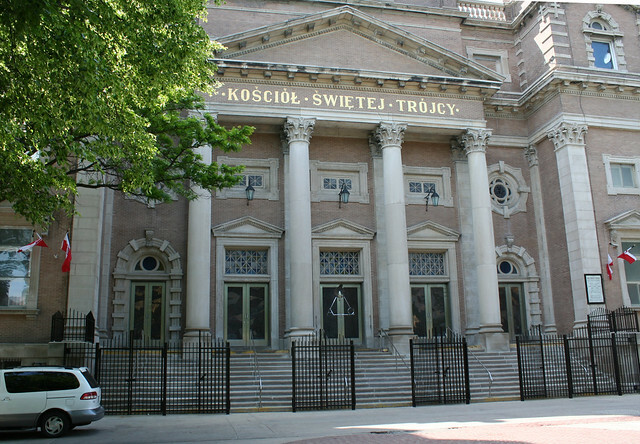 Today, Holy Trinity Church remains true to its roots – signs and services are mostly in Polish, as is the church’s official website. The church featured in the movie “Call Northside 777” with Jimmy Stewart. Many excellent old shots of Chicago in that 1948 film. Not sure if my earlier comment was posted….. 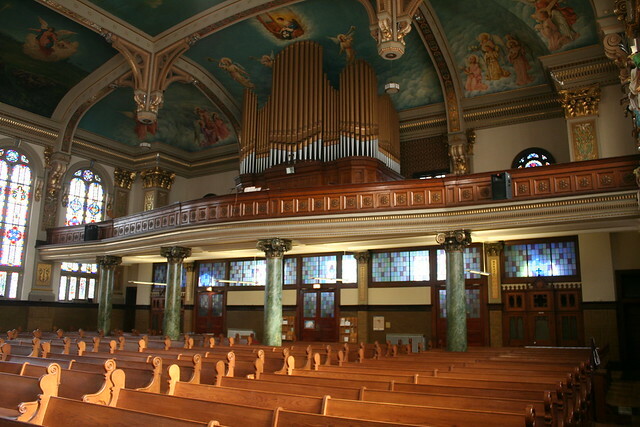 These amazing churches prompted me to search the temple in Logan Square where my family worshipped. Unfortunately it was torn down decades ago due to the changing neighborhood. It was a beautiful building built in the 1920’s. 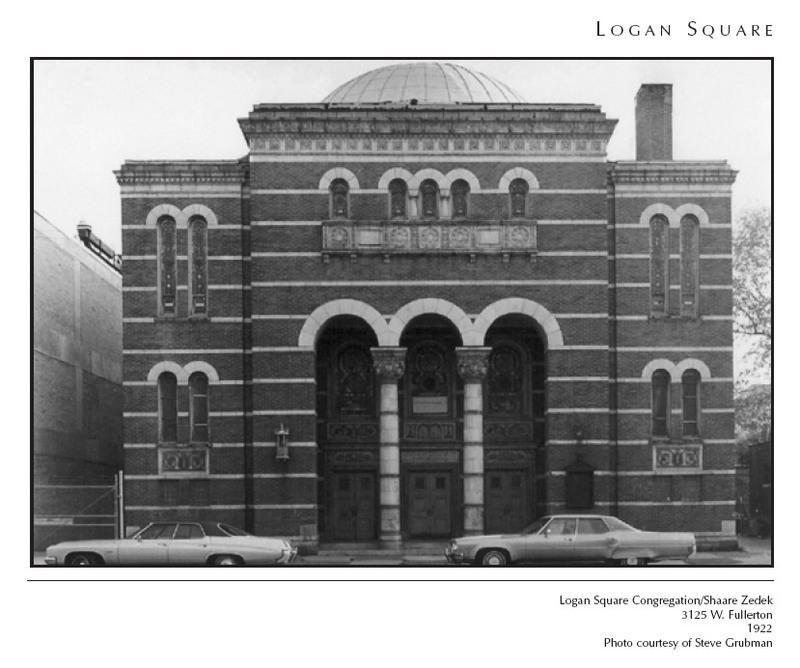 Below is the only photo I was able to find of the Logan Square temple located on Fullerton. My parents were married in Holy Trinity, 1948. @ Debra, thanks for posting that picture of the temple. I lived at Lyndale and Palmer in the 1960’s. I did not go to the temple, just played around the neighborhood. My friend lived a few doors west of the temple. If I remember correctly, Auto Flywheel and Clutch was just east of the temple. My grandparents lived a few blocks west of the temple, on Fullerton and Spaulding, above the package goods and bar that they owned with my dad and uncles. I wanted to add….their store was directly across from the Bohemian Funeral Home. While the funeral building is still there with its beautiful facade it is now a ashram or yogi studio, I believe. The bar my family owned is now a beauty parlor. I know exactly where that was bar was. Another one of my friends lived just south of Fullerton on Spaulding. Knowing my Dad he was probably in that bar once or twice. It was a real neighborhood bar so if your dad was in the neighborhood he might just have stopped in.